Want to be more productive, more accountable, and meet amazing people around the world, without leaving the comfort of your couch or breaking the bank? When the founder of Forest Co, Danny, couldn’t find a physical coworking space in Malaga, Spain, he had the idea of searching for a virtual coworking space and couldn’t really find anything good enough. But what about when you can’t really “up” your average? What if you can’t physically surround yourself with the right people? That’s why he founded Forest Coworking. He wanted people like you and him to have access to most of the benefits of a physical coworking space, without the physical restrictions, like location. Moreover, he wanted this to be affordable. Coworking spaces can be very expensive. In big cities like Toronto or New York, good luck finding a seat for less than $300 / month. It is a community of like-minded individuals who like to work hard while meeting other people both for business or personal reasons, or both. Screenshot of a random moment on the third day after launch. “Forest Virtual Coworking is a novel approach to combatting loneliness as an entrepreneur. So often, we find ourselves at coffee shops, in our apartments, or in coworking spaces alone and isolated from the rest of the world. But, there are similar people out there. There are people on a similar mission. There are people with similar mindsets around the world who we now have access to with the click of one button and the simple movement of our avatar! Forest Virtual Coworking allows us to build relationships and connect with people everywhere who are looking to make an impact. "Danny's virtual co-working space is something I've never seen before. The ability to hop on a video call with someone like Danny Forest at any time of day isn't an opportunity that's given often. I work from home, so now that I have a virtual spot to commune with fellow digital nomads, I feel like my social life has improved a little as well. Connections are everything in the digital world, and to be able to work alongside anyone from any part of the world is quite frankly mind-blowing. I love this idea!" anything else we may collectively think of! If you have any ideas for an event or would like to organize one with us, let us know at coworking@forestco.co. Looks more professional than working from home. *Apologies for the low-quality audio. How about you book a 10-minute tour with us? Just fill this form out and we’ll reach out within 24-48 hours. What intrigues or interests you the most about virtual coworking? Because we pay our service provider by number of seats, we cannot offer free trials on a regular basis. However, until April 2nd, you can sign up for a month for FREE! What browsers do currently you support? Our provider currently only supports Google Chrome. We are working with them on potentially supporting other browsers. What if my internet connection isn’t great? No worries, most of the features will still work perfectly fine with a poor connection (<5mbps download speed). As any other video chat app, the video chat feature will be choppier if the internet connection isn’t as fast. The rest will work perfectly fine! Why is this better than a physical coworking space? It is not dependant on a location, meaning you can be in your favourite environment all the while connecting with the most diverse community of like-minded individuals on the planet. Will I be distracted by other people? The biggest cause of distraction in an office setting is tap-on-the-shoulder interruption, which can’t happen in the virtual world. A notification is much easier than someone tapping on your shoulder! What if I don’t speak good English? Some virtual spaces are organized by languages. Also, chat in any form (text, audio, video) is optional. You can still benefit from the accountability and many other features without ever speaking to anyone. Will I really meet people? You bet! And from a much more diverse background than in a physical coworking space! People assemble in the kitchen for lunch, the break room or even the gym. These are great places for connecting with other people on the platform. Can I invite guests / clients? 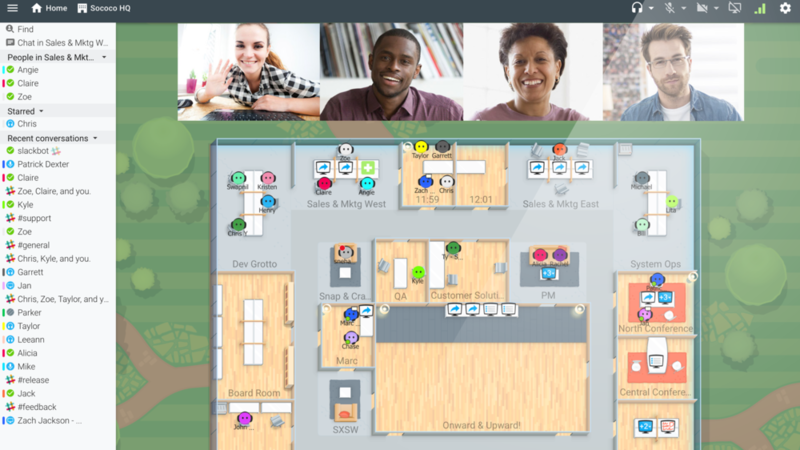 You can invite outside users to any room in the virtual space you work from. If you used the tour booking feature with us, it’s the exact same thing! How frequent are the events? Are they optional? We try to have events once a week. They are completely optional. How can I spread the word about Forest Coworking? We are glad you asked and thank you for your interest. We have a Referral program where you can make decent money while showing your appreciation for the Coworking. More information here: Referral Program. Where can I send my suggestions?